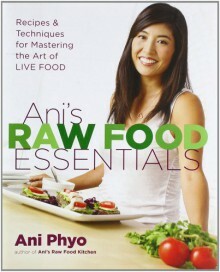 Chef Ani Phyo is back with Ani’s Raw Food Essentials, full of everything you need to know to master the art of live food. Phyo shows you how to whip up simple, fresh recipes using what you’ve already got in your kitchen while also offering tips on dehyrating and more sophisticated techniques. Looking for innovative meals that are healthy and delicious? Phyo offers everything from classic comfort foods like nachos and burgers to Reuben sandwiches and bacon, along with more gourmet dishes like risotto, angel hair pasta, and her you-won’t-believe-they’re-raw” desserts.Ani’s Raw Food Essentials once again proves that you don’t have to sacrifice taste to reap the benefits of raw foods, all while living a greener lifestyle. Recipes include: Broccoli and Cheeze Quiche, Kalamata Olive Crostini, Cashew Tofu” in Miso Broth, Grilled Cheeze and Tomato Sandwiches, Cheeze Enchilada with Ranchero and Mole Sauce, Pad Thai, Pesto Pizza, and many more.